The wireless music streaming market is hotting up with Philips determined to break into the premium side of the scene with its new Fidelio wireless Hi-Fi range. 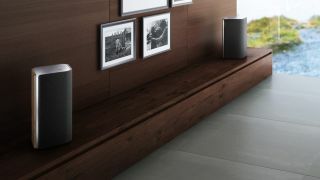 Philips has a range of three speaker sets at different sizes: the Fidelio AW3000 is intended for your smallest rooms, the AW5000 for your medium sized parlours and the AW9000 are proper big speakers for the larger rooms in your house. Each comes in a diamond shape rather than the traditional oblong set up; this decision was part design, part sound-quality driven, broadening the musical sweet spot out across the room. The wireless system is controlled by an app, Philips AirStudio, which is available free on iOS and Android. The big top end AW9000 speakers feature 6 Hi-Fi transducers have both digital and analog inputs, while the smaller AW5000 is a single unit with two soft dome tweeters and two 4.25-inch mid-woofers. The comparisons with the Sonos Play:3 and Play:5 systems are immediately obvious and the company isn't really making a secret of the fact that it's going after Sonos' market. Philips explained to press this morning that Sonos is good, yes, but Philips' Fidelio wireless range comes at a more attractive price (starting at £200), a more premium design, with no middle-man pairing bridge and the ability to stream music from your phone or iPad. What it doesn't come with – at least, not at launch – is much in the way of internet music. There's internet radio and a partnership with Napster, but no Spotify, Last.fm, Deezer or any other streaming service – Philips says these are coming soon but couldn't say when. Sonos, of course, has these in spades and has even opened up its API to allow other music services to get in on the act. The other differentiating factor is that Sonos is intended as a multi-room system so you can play the same music in more than one place at once; Philips' wireless system does not offer this feature (although unless you're a party mogul, you might not mind too much). If you fancy the wireless music action but you've already got some quite snazzy speakers, Philips also has two media streamers coming soon – the Fidelio AW1000 wireless link and AW2000 wireless hi-fi receiver with amp (below) will be available in September. The Fidelio AW3000, AW5000 and AW9000 are out this month priced at £200, £300 and £500 respectively, while the Fidelio AW1000 and AW2000 will be available in September priced at £150 and £250.